Rosewood body with beautiful flower shaped sound hole, Italian Aquila nylon strings, close type tuning nobs and rosewood bridge, exquisite workmanship and excellent sound quality. 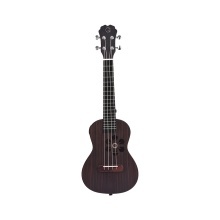 Comes with a ukulele bag, 4pcs extra strings, a capo, 2pcs picks and a USB charging cable. You can download the APP via the OR code in user manual.